This moment has come, therefore I shall begin with the very end. In a few days my university student life will be over and as you may or may not know by now, at this very end I have to create a fashion collection for my degree. Now, the fact that it will be showcased properly or not, is a different story. Last time I did this was when I had my Carnivale Collection and along with my, then, colleagues organised a fashion show. It was not the best, not the worst, but it worked somehow. This time, when we should be one step further, on every aspect and every level, our faculty decided to screw us over a little bit, so that we can leave from this student experience with a truly momentous memory. And after many hours and many attempts to make it work, nothing changed, so I decided to just accept it as it is and not care as much. Therefore, our "event" will be held this year, Wednesday, the 29th of June, at 10 a.m. (yes, that means in the morning) at the Mansarda Gallery from our faculty. 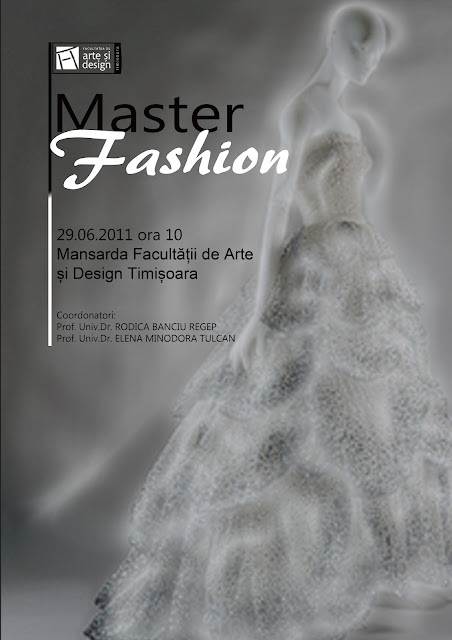 miercuri, 29 iunie, ora 10 (dimineaţa) la Galeria Masarda din cadrul Facultăţii de Arte şi Design, Timişoara. It is still an open to the public event, so anyone can come, you are all invited. If you can't make it, you probably won't miss much. That being said, heads will roll so let's get it on...over with.